Prudencia L. Fabro, the first Filipino President of Harris Memorial College, was one of the most outstanding woman leaders in the Methodist-related institutions whose major contribution was the training, molding and forming of young women who answered the call to serve as deaconesses in the Methodist Church. She was sent as Crusade scholar to Drew University in New Jersey for her Master of Arts Degree in Rural Sociology. She returned to join the Harris faculty in 1948. 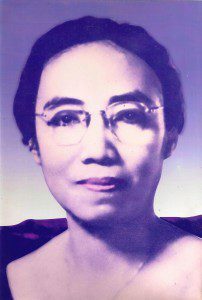 In 1951, Ms. Fabro was appointed as the first Filipino director of Harris Memorial School, replacing Ms. Mary Evans, the last American missionary to head the school. In recognition of her outstanding leadership in the training school, she was conferred an honorary Doctor of Humane Letters degree by Kansas Wesleyan University. In 1968, the school community celebrated its recognition by the government as a four-year college institution. Dr. Fabro became its first president. With courage, integrity, spirituality, quiet dignity and humility, Dr. Fabro was the most influential figure in shaping the direction of Harris Memorial College, particularly in the formation and transformation of young women for deaconess service during her time. Taken from Methodism in the Philippines: A Century of Faith and Vision, ed. by Bishop Jose Gamboa, Jr., Gamaliel T. de Armas, Jr., Roela Victoria Rivera, and Sharon Paz C. Hechanova. (Manila: Philippines Central Conference of The United Methodist Church, 2003).